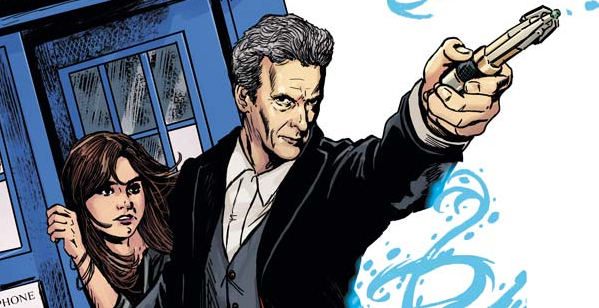 DOCTOR WHO COMIC UK #6 Review #DoctorWhoCUK | Warped Factor - Words in the Key of Geek. Since acquiring the Doctor Who comic book license Titan Comics have not hung around. This time last year they launched their Tenth and Eleventh Doctor titles, and joining them in October was the Twelfth Doctor. Overall, both the stories presented and the artwork have been nothing short of spectacular. It was no surprise then that the range of titles have all been amazingly popular, flying off the shelves of comic book stores around the globe. But what about those who couldn't get to a comic book store? Well, Titan thought of that, and back in February they launched a Doctor Who comic produced exclusively for the UK market. Not only will you find it in your favourite comic book store but it's also there on the high street - on the shelf in WH Smiths and many independent newsagents. If you've not taken the plunge as yet, then issue #6 of Doctor Who Comic UK is the perfect time to dive in, as three new adventures begin within its 84 pages. First up, the Twelfth Doctor discovers something sinister in Shoreditch (haven't we all?) in The Fractures, Part 1. But Coal Hill School and its environs can be just as deadly as any alien planet or far future, as the pair will soon find out! There are two type of Doctor Who comic book stories; those that would fit right in and work perfectly on screen, and those that are a little more abstract and probably work better within the pages of a comic book. The Fractures is one of those stories which you could absolutely imagine working on the TV. And well. Sticking quite close to the events of series 8, and featuring Kate Stewart & UNIT, it's the first part of a three part adventure - trust me, you're gonna wanna buy the next two issues! As jumping on points go, this ones a doozy! Our second strip is a one-shot timey-wimey space loop story for the Eleventh Doctor - Space In Dimension And Relative Time. The Doctor, Alice and Jones left the SERVEYOUinc United System Research Base behind, travelling on to new adventures. The TARDIS gang has grown yet further because of their last encounter, with the addition of the hulking shapeshifter known as ARC – who is a lot more polite and inquisitive than its threatening appearance would suggest. But is even the TARDIS big enough to support this many large personalities? You know those comic strips that are a little more abstract? Here's one of them. And that's by no means a negative. Once you wrap your head around Space In Dimension And Relative Time you'll find a neat little story, albeit one that probably wouldn't transfer to the small screen too well. That being said, it's a little like the Christopher Nolan movie Memento... a little. It's a backwards time story, with a nice little touch of numbering the pages in reverse (little things make a big difference). And there's a Nimon involved. We like the Nimon! Finally, our third strip, part one of The Weeping Angels of Mons, features the Tenth Doctor in the midst of the world's dark history. The Doctor offered Gabby a one-off time-travelling trip aboard the TARDIS. They arrived at an alien art gallery where Gabby was thrown straight into the heart of adventure, with no shortage of the life-threatening danger that seems to follow the Doctor no matter where (or when) he is. Proving herself to be a bright and brave companion, the Doctor has invited her to join him in exploring the universe. Another story that could quite literally be ripped from the TV screen. The Weeping Angels of Mons is solid Tenth Doctor material, perfectly paced and finding the right balance between the light and dark moments. And there are dark moments to come. You will not want to miss parts 2 and 3 of this one. In addition to the three main strips there are some single page funnies, which means, in short, Doctor Who Comic UK represents excellent value for money. 84 pages featuring three very faithful new adventures for the three most recent Doctors for just £3.99? How can you not want that? 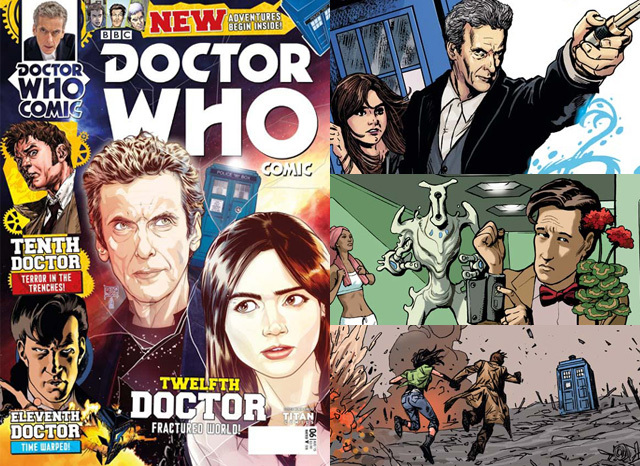 Doctor Who Comic UK #6 is available in newsagents now, alternatively you can subscribe and get a free Doctor Who Top Trumps Collectors Tin!